Comodo Antivirus Review 2019 - Something You Need To Know! Comodo produces some extremely capable antivirus and internet security tools for both free and paid users. There’s much more to these tools than nicely designed menus, and – besides the gamer mode – I was wowed by the platforms’ seamless sandboxing and powerful features. 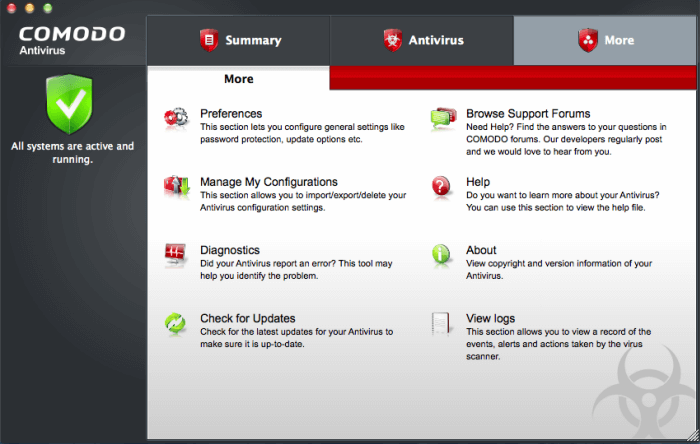 Comodo’s stable of consumer antivirus products is well-known for their slick user interfaces. But did you know that the company is also one of the few antivirus companies to offer a free tool for Linux and a free antivirus for MacOS? I tested Comodo Antivirus, Antivirus Advanced, and Internet Security to find out if they live up to their reputation. Comodo’s antivirus offerings include a free product, Comodo Antivirus, as well as Comodo Antivirus Advanced, which offers instant virus removal and real-time scanning which checks users’ system files against those identified as malicious by cloud-based systems. Comodo Internet Security, available as a free download, provides an impressive variety of internet security features including Default Deny Protection, “application control” (a tool that verifies that only legitimate applications are running on users’ computers), and cloud-based whitelisting to help users quickly identify legitimate files. The Antivirus Advanced program provides some particularly impressive features which include the company’s trademarked “Auto Sandbox Technology.” This functioned so smoothly during my testing that other than noticing the Comodo graphics I would have no idea that a potentially suspicious executable had been run in a virtual environment. Notably, the company is also one of the few antivirus companies to offer a free tool for Linux (supported distributions include Ubuntu, Fedora, and OpenSUSE). It also offers a free antivirus program for Mac OS that features instant file scanning as well as the ability to execute virus checks with a single click. Let me put it this way: if you’re a desktop user, Comodo has a security solution for you! The Comodo antivirus and internet security products manage to bundle some great features. In fact, the mix of tools that they have assembled would be difficult, if not impossible, to find elsewhere. Game Mode: Have you ever been immersed in a game of World of Warcraft and then had your attention torn away by an antivirus program’s quarantine popup? So have I, and it wasn’t fun! Thankfully Comodo’s antivirus programs offer a “game mode” which suppresses such unwanted messages while the user is gaming. Application Control: Not all antivirus programs can offer the tools to help users navigate that difficult territory between operating a functional-but-infected system and having to recover a totally broken and un-bootable one from a Live USB. Fortunately, Comodo covers that gap. Its Application Control allows users to lock down their system and only use programs that are known to be safe. Comodo really goes the extra mile to makes its user interfaces visually appealing and functional. In addition to the “Game Mode” feature, I loved the ability to initiate a scan with a single click, control exactly when and how popup alerts would display, and even select a theme to style the program. While some antivirus manufacturers have contented themselves with delivering a great product under the hood, I’m pleased to report that Comodo continues to set a high bar for the industry in terms of UI design. Comodo’s support is centered around its online portal which includes both a ticket answering system as well as a live chat window. Comodo can be justifiably proud of its well-deserved reputation for responsiveness: most tickets receive a response within an hour (mine took less), and I got through to a helpful live chat representative in under ten seconds. Comodo’s live chat assistance is always quick and courteous. If self-help is more your thing, the company also maintains a great knowledge base and an active users’ forum as well as telephone and email support—with dedicated enterprise channels. Truly an all-around offering! Of the three products I played around with, only Advanced Antivirus 10 is a paid product. For the impressive selection of features it offers and the consistently good support, it’s a fair deal—particularly at the 3-device protection level and when subscribed to for 3 years. Comodo deserves praise for much more than its industry-leading attention to design usability. Its basic and Advanced antivirus products provide robust cloud-based protection against viruses and malware and the Auto Sandbox Technology functions like a dream. In addition, I give their support team top marks for responsiveness and knowledge. hich ended in encrypting some of my files), second on had great protection but also was quite insufficient as anything other than protection. I was suprised that Comodo can give me both things, and both are good. Cons: console sometimes have minor problems, and unfortunely most of it is dependent on their issues, however clients are working fine. Also it is not the cheapest product. So, to conclude, it's very complex and effective piece of software, combining both - protecting and managing in one, well-designed product.